June Marie Gilbert, 80, passed away on April 21, 2017 in Mesa, Arizona. One of God’s angels, she was born on June 30, 1936 in Sisseton, South Dakota. She was a school teacher and business owner. She spent the last 22 years in Arizona. She is survived by her husband, Don; her children, Ronald and Kimberly, as well as 3 grandchildren and 2 great grandchildren. Death of a loved one is hard to deal with, but please take comfort in knowing that our loving Creator has promised that he will soon “swallow up death forever” and “wipe away the tears from all faces”. 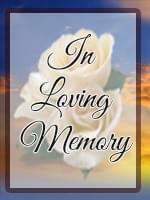 (Isaiah 25:8) Please accept my condolences for your loss during this difficult time.